Give blood and share life…. your donation is a hope of life for someone else. Many patients in the hospitals die just because of less blood availability. Your donation may save as many patients as possible. No heroic deeds are required to save the humanity just say yes to donate. Your donation may be in the form of blood, medicines, finance for cure or very simple to support such programs and companies which are being working in this regard. Every 10th patient in any hospital needs for blood. Your donated blood is a message of life for them. Provide them a hope for life because your donated blood is a memo of life for someone needy of blood and similarly others donation for blood can save your beloved’s life. You blood donation significant of life. you know only 10% of population donate the blood and other 90% relay on their donation. you donated blood may save a precious life. Pakistan is a developing country; near most 45% people are living below the poverty line. Aaaah. Many district hospitals and dispensaries are still in bad conditions and the services are very bad even they have no Medicare staff and medicines also. Such nonprofit hospitals are waiting for your upfront payments and funds in form of money or medicines. So you may donate in this regard and give the message of life for such paitients who can’t afford medical expenditures and pass away. Save their lives by your donations. they are waiting for your donation. Everyone has a circule of friends and relatives and we at merablood request you, let them know about merablood.com. Because there someone or more needy or donors from your friends and may be thanking you the rest of his or their lives. 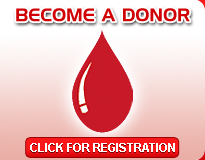 Regular and committed donors are required to make sure of blood donation. we don’t want great and difficult tasks from you, you could just do it with a small thought and even smaller by saying yes for donations and telling others about merablood.com. Do inform all your friends and help us in this noble deed.